Description: The American crow, which is found across all of the United States and most of Canada is an all black bird that is about 17.5 inches long. It is often misidentified as a raven, a bird to which it is closely related. Crows differ from ravens in appearance by their shorter, thinner beaks, and by their size - about six inches shorter than a raven. Crows may appear to be a deep purple color in bright sunlight. The scientific name brachyrhynchos means "short beak." 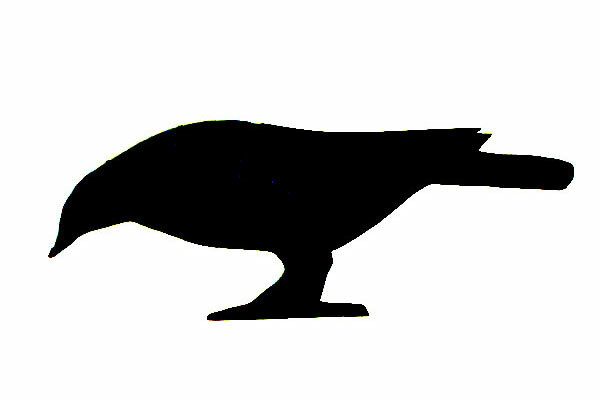 Actually, the crow's beak is fairly large, 2-1/2 inches long, but short compared to that of the closely-related raven. Calls: The normal crow call is a loud caw or awk. The call is often vocalized in a short series - "caw caw caw". They also produce a variety of rattles, coos, and clear notes. Range / Habitat: Crows can be found in a variety of different habitats, though they generally prefer open and partially open areas. They are commonly found on tidal flats, in agricultural fields and orchards, riparian forests (forests along the edge of a lake or stream), on savannas, and in suburban areas. They avoid dense forests, where they are more vulnerable to predators. Click the range map to learn more about the distribution of American Crows in Washington. Diet: Crows like to feed in open areas, and sometimes forage and catch food cooperatively. Crows are carnivores (meat eaters), granivores (eaters of grains and small hard fruits), and invertevores (eaters of invertebrates). They most commonly eat small animals, grain, fruits, insects, and carrion (the flesh of dead animals). Crows are essentially opportunistic - they will eat whatever is available. Crows and all members of the family Corvidae will store excess food. Crows sometimes will bury food in the the yard and cover it with leaves or grass. They also hide food in trees or rain gutters, or another spot. Like squirrels, crows will retrieve the stored food when needed. Nesting: Crows make their nests in trees, shrubs, and on utility poles at varying heights above the ground. The average height for a crow’s nest is about 24 feet. Their nests are cup shaped and made of twigs. A female crow will lay 3 - 7 eggs in the nest and incubates them for about 18 days, during which time her male partner will feed her. The male and the female will both tend their young birds, which are able to fly at 4 - 5 weeks, and disperse in about 2 months, or may stay in the area where they were born. Behavior: Although it is not widely known, the very common American crow is one of the most intelligent of all birds. The crow's intelligence is apparent in its ability to communicate a wide range of messages through its call. It can communicate warning, threat, taunting, and cheer to other crows by varying the "caw" sound it makes. Its cries of warning are specific enough that some animals other than crows are also able to use them as signals of dangerous predators. Crows can mimic the sounds made by other animals. Crows travel as far as 40 miles each day from evening roost sites to daytime feeding areas. Crows usually post "sentries," who alert the feeding birds of danger. Crows are known to drop hard-shelled nuts onto a street, and then wait for passing automobiles to crack them (watch the video). Crows in coastal areas drop mussels and other shellfish on rocks to crack the shells open and expose the flesh. Lifespan/Longevity: A wild crow was recorded living for over 15 years (banded by Kevin McGowan, Cornell University). A lifespan of 6 to 10 years is the norm since there is a mortality rate of about 50 percent in the first year. Captive birds may live much longer - one captive crow in New York, named Tata, was recorded to have lived for 59 years! American Crows congregate in large numbers in winter to sleep in communal roosts. The American Crow appears to be the biggest victim of West Nile virus, a disease recently introduced to North America. Crows die within one week of infection, and few seem able to survive exposure. Young crows stay with their parents and help them raise their younger siblings in subsequent years. A group of crows is called "A Murder". Wild crows can recognize individual people. They can pick a person out of a crowd, follow them, and remember them — apparently for years. But people — even people who love crows — usually can't tell them apart.